Annan Athletic have secured the last play off place with 3 games to go after they securing a point with a 2-2 draw in a game that epitomized what live football is all about. The home team secured the point that ensures they make the play offs but left it very late with Ayrton Sonkur grabbing the equaliser with the last kick of the ball in the 94th minute. It was a late show from Annan who never gave up in a stirring second half performance and they had to overcome a dubious penalty kick to fight back and overturn a 2 goal deficit. Stirling Albion came to Galabank knowing they could put Annan’s play off hopes on hold provided that they could secure the victory that would delay Annan’s place in the play offs. Stirling welcomed the return of Danny Jardine and Ross McGeadie to the squad but the visitors were still without the services of striker Peter MacDonald and ex Annan player Max Wright. Annan boss Peter Murphy was without the injured Peter Watson, Ryan Sinnamon and Ross Ferguson. Stiring got off to a flier and went ahead in the 3rd minute when they cut Annan open down the right flank ending with Lee Hamilton’s near post low cross found Darren Smith and the Stirling Striker made no mistake from close range to give the visitors an early advantage. Scoring opportunities were rare in the first half Kyle Banner’s header in the 24th minute failed to hit the target and almost immediately Mitchell pulled off a routine save from Lewis McLear’s effort form the edge of the box. Annan’s scoring opportunities were few and far between with Callum Ferrie in the Stirling goal not being seriously tested. As the game approached half time Daniel Jardine’s right footed effort was saved by Mitchell. The second half started with Annan taking the game to the visitors, Calum Ferrie pulled off a fine save to deny Tony Wallace whos shot was saved low down by the keeper. Kyle Bradley followed this up with an effort which sailed over the bar. Annan were taking the game to the visitors and Aidan Smith’s header looked net bound until Ferrie tipped the effort over the bar. The Stirling keeper from the resulting corner was at hand once again to save Swinglehurt’s header for another Annan corner. Stirling then against the run of play won a penalty kick after Swinglehurst was adjudged to have fouled Jordan McGregor and Darren Smith converted the spot kick to give the visitors a 2 goal lead. Annan immediately made a couple of substitutions with Nade and Wilson replacing Moxon and Muir. 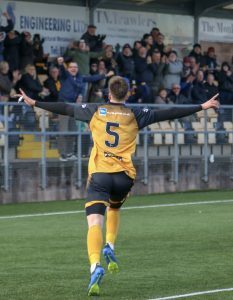 Annan continued to take the game to Stirling and as the game entered the final 10 minutes Annan’s chances of saving the game appeared to be disappearing . Swinglehurst’s 86th minute header was cleared off the goal line as Annan piled on the pressure. Then came the breakthough in the 88th minute when the Albion keeper pushed Tony Wallace’s effort into the path of Christain Nade who scored from close range but from a tight angle. The equaliser came in the 4th minute of injury time when Chris Johnstons corner kick was met by Ayrton Sonkur whos left footed shot found the corner of the net from 6 yards.